Ford's just unveiled the latest iteration of the venerable 35-year-old Fiesta, and it's brimming with technology you'd normally associate with much bigger, more premium cars. You've got Ford SYNC, intelligent driving-aware safety features, personalised keys, and even a five-inch screen to keep you entertained, all packed into its supermini chassis. 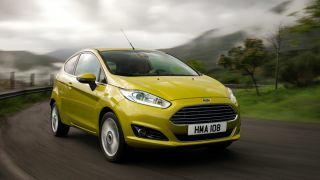 Here are our 10 favourite techy toys in the 2012 Ford Fiesta. Ford's finally put Ford SYNC in a car headed for the UK that's perfect for city driving. It's Ford and Microsoft's stab at vehicle connectivity, enabling you to hook up a phone or media device, either via USB or Bluetooth. SYNC will connect to most modern smartphones, with Android, BlackBerry, iOS, Windows Phone and even Symbian included. Ford and Microsoft continue to regularly check phone compatibility, with 290 already tested. Up to five different phones or devices can be connected via Bluetooth at once, which means anyone in the car can stream their own music. Once integrated into the system, you can then browse media, make calls with integrated phone book scanning, have texts read out to you with built-in recognition of text speak and certain smileys, and pull off other in-car entertainment control features simply with the sound of your voice. OK, you might feel a bit stupid shouting at your Ford Fiesta, but at least your eyes are on the road. Ford is also continuing to develop SYNC with Microsoft, and will push out updates that can be uploaded to the car via any standard USB flash drive. The next update, which should roll out soon, will enable control of a selected number of third-party apps on both iOS and Android, meaning not just the stock music player will respond to voice commands. Ford's taken the traditionally expensive emergency services automatic calling feature from the likes of OnStar in the US, and thrown it into the mass market on the Fiesta. Emergency Assist uses your own phone as the line out instead of charging you a monthly line rental just for your car's emergency system. If you end up in a crash, the car will phone the Europe-wide emergency services number, 112, and give the operator your exact location from the GPS. Not only that, but it speaks 11 languages and will deliver the message in the appropriate language for whichever country you happen to be in. It will then provide hands-free calling, connecting you directly to the operator. Ford has positioned the SYNC system in the car to survive a crash, and has conducted crash testing with phones in the cabin. Apparently, the phones survive perfectly fine to make that potentially life-saving call. The SYNC system will also connect with up to five different phones over Bluetooth, with one handset defined as the master. If the primary phone fails to carry out the emergency call, the system will try all the others until one of them connects to the phone network. It's a good way of getting around the expensive monthly subscription fees other systems have, due to their traditionally integrated cellular network connectivity. Have you got kids who always want to borrow your car? Do you worry about them out on the road, burning rubber and blaring music through the neighbourhood? Ford's got the solution. MyKey enables you to set up a custom driving profile bound to a subset of the individual keys. For instance, your kid's key can be set up to electronically limit the maximum speed of the car, or to mute the radio until all the seat belts have been securely fastened. Likewise, you can enable or disable various in-car alerts, such as speed thresholds, fuel warnings, and seat belt monitors.